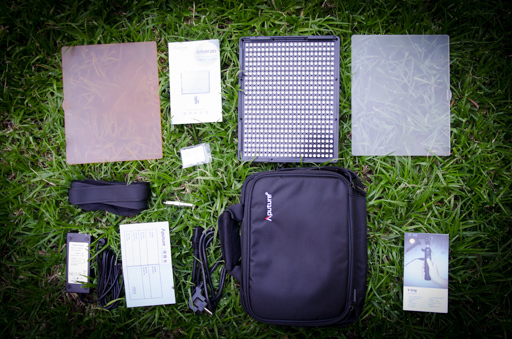 A short while ago I got three of Aputure’s Amaran LED panels. While there is a full review coming, I wanted to share my first impressions. 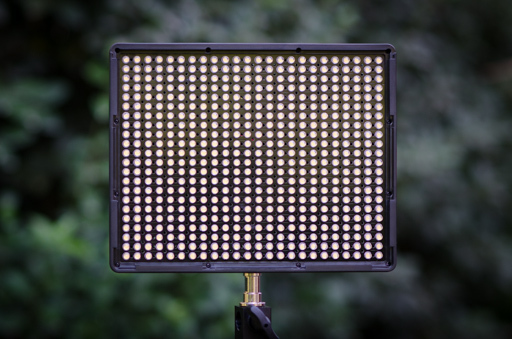 The Amaran LED AL-528x system is a low budget LED lighting system. The name hints on the fact that each AL-528 body consists of 528 LEDs. There are three members in the family, each with slightly different main features. I am going to quickly go over the three types and then share my first impressions. 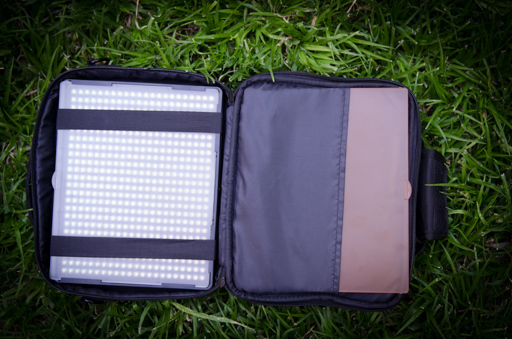 The lights sell for about $180 on Amazon which makes them a good entry level lights. 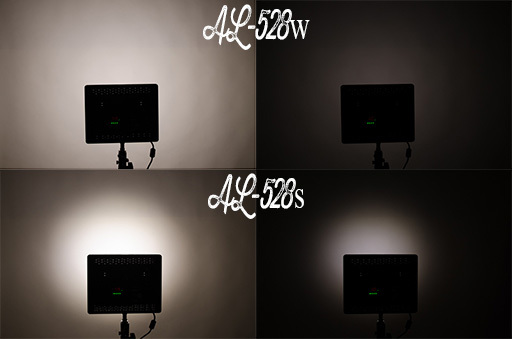 AL-528w – This is the basic light which has one control over brightness. The LEDs spread is 75 degrees @ 5500K. 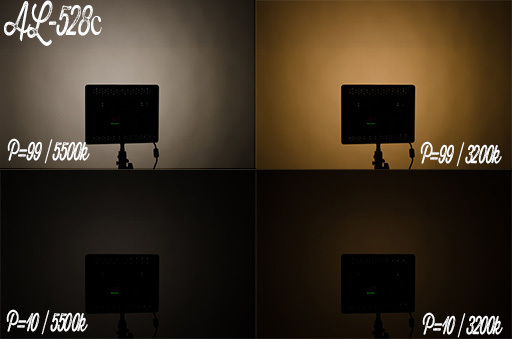 AL-528c – This panel has both brightness control and temperature control (same 75 degrees spread). Temperature shifting is achieved by splitting the LEDs into two groups, white and orange, and controlling each group intensity. This is quite a common configuration for temperature changing panels. The first thing that I looked at were the lights, and for a $180 deal, they give a pretty decent value for money. There are things that I like about them and things that I don’t, but as an entry level light, if feels like a pretty good bargain. The iPad sized panels have a bit of a plastic-y feeling to them, which is what I would expect at this price level. There are two metal 1/4-25 mounting points on each panel: vertical and horizontal. It is a bit different than the bracket system used in some of the other lights for mounting, and I felt I had to be very gentle with the stud. The light quality, on the other hand, felt pretty good. I have not yet tested them with a temperature-calibrated light meter so I can not testify to accuracy, but they “feel” at the right temperature, and if you look at the charts below, the light is pretty persistent. The light fall off is just what I was expecting and was quite satisfied out of the box. Once the diffusion panel goes on, it only gets better. See this comparison chart with all the shots taken at ISO200, 1/100 @ f/5 calibrated to 5500 Kelvin. Each panel has a round radio button at the back – the type you rotate, not the type you press (thank god) with control going from 10 to 99 and a clear display of the settings. Both for power (and for temperature on the AL-528c). This is a very comfortable way of controlling lights and it is easy to recreate setups to the stop if you write down or photograph the settings. The button is a bit too loose for my taste, but still miles better than those tiny RC-like push buttons. The power unit and filters feel pretty solid. The swivel is the cheap plastic type you get on eBay for a few bucks. It does the job, but it doesn’t feel nice, if you know what I mean. The best accessory of them all is the bag. It is a self contained unit, which is a masterpiece of space usage. 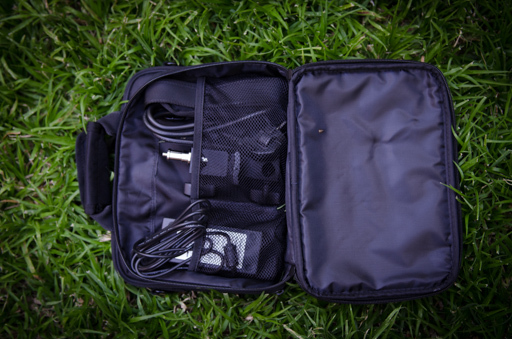 everything fits is nice and snug and it wraps up to a single self contained light kit. It feels very top notch quality. I would probably paid some nice $$ just for the bag. After a short usage with the three units, I can definitely say they are a good bargain, for about $180 a piece they are to start with and build from. 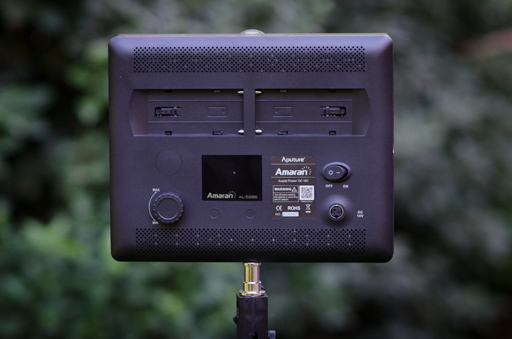 There will be more coming with video tests and a more complete review so stay tuned. Thanks for sharing this LED light post, look forward to more updates. where to buy,you can buy them from here. heya, everything is relative. $180 is not that bad for a first unit if you are planning to lag it around for a long time. I think you have the 528W and 528S descriptions reversed… (just above “what’s in the box”) isn’t the “s” is for spotlight and “w” for wide? hi, my name is rodrigo, im from brazil , for 180$ i can get 4x wansen W260 , instead one al-528s , it will give me 1040 leds = 72w, im running a low bugdet rig , with a canon EOS-M , and i would like to know some opinions if this deal worth, 2xw260leds would be greater than 1 AL528s?